A school in the Catholic Diocese of Covington barred a gay valedictorian from speaking at his own graduation. 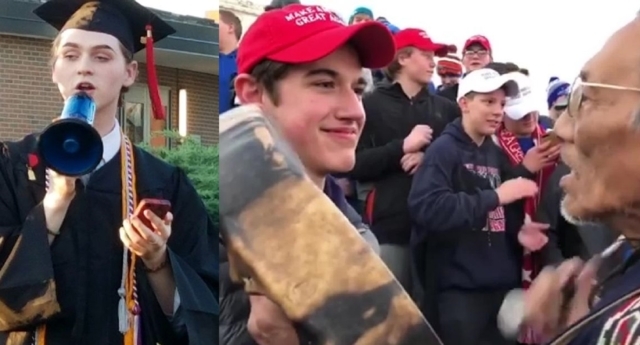 The private Kentucky Covington Catholic High School faced scrutiny this week after clips went viral of students attending a January 18 anti-abortion rally in Washington, DC, wearing ‘Make America Great Again’ hats and clashing with Omaha tribe elder Nathan Phillips at the nearby Indigenous Peoples March. It’s not the first time the school diocese has made headlines, however, with officials facing backlash in 2018 over a decision to bar a gay gender non-conforming valedictorian from speaking at his official graduation ceremony. Valedictorian Christian Bales was denied permission to give his speech at the official graduation ceremony at the connected Holy Cross High School, which is also run by the Catholic Diocese of Covington, in May 2018. The reasons behind the decision were never made clear, with Bales referencing “opposition” to his planned speech before touching on charged issues including gun control. Bales’ mother alleged that the school principal had contacted her to seek an assurance that Bales, who is gender non-conforming, would not wear make-up or dress in feminine clothing for the speech, prior to the ban. Bales, who gave the speech without permission from a nearby lawn after the ceremony, said he does not know whether his sexual orientation played a factor in the decision. Speaking to NBC this week, Bales said he was not surprised by the behaviour of the students in DC, explaining that Covington Catholic High School was “notorious for being a not-well-disciplined school” and claiming policy is controlled by the “archaic” Catholic Diocese of Covington. Bales added that the students “were not blameless” in the incident, despite President Donald Trump rushing to defend their conduct after further footage revealed that they had faced abuse from a third group at the DC rally. In a statement about the valedictorian speech ban in May 2018, a spokesperson for the Diocese of Covington said: “School officials and representatives of the Diocese of Covington reserve the right to review and approve all student speeches to be presented in public at high school graduations.